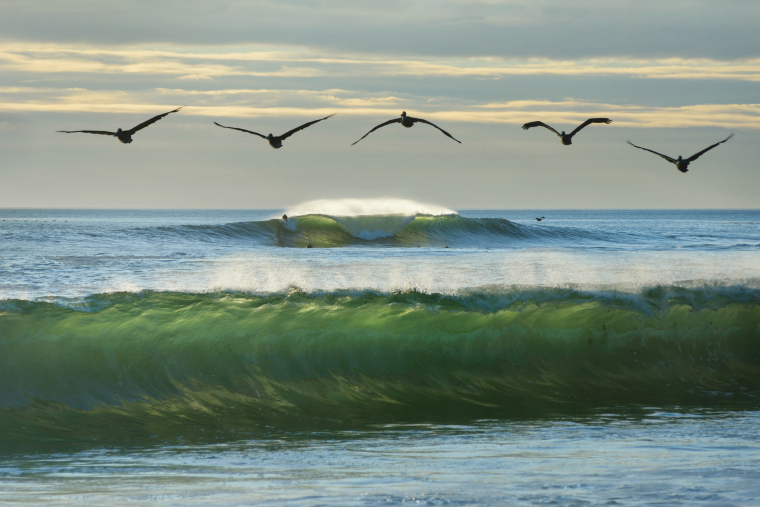 Among the many stunning images of California in "Ecosystems of California" is a photo by Davenport photographer Ed Dickie, of California brown pelicans in flight over breaking surf near Scott Creek on Santa Cruz County's north coast. 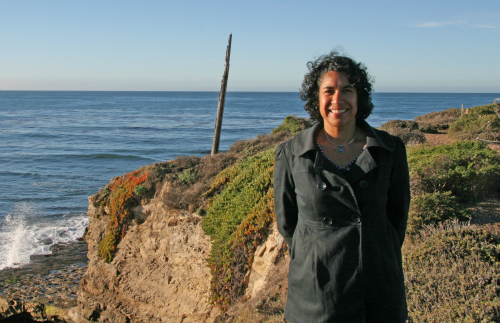 Co-edited by Erika Zavaleta, professor of environmental studies, the book is a comprehensive look at the California's ecosytems, with views of the past and present, and a look toward the future. 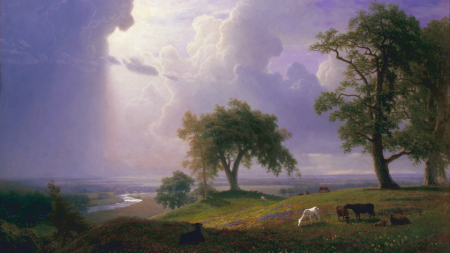 For the cover, Zavaleta and co-editor Hal Mooney selected an iconic 1875 Albert Bierstadt painting, California Spring, that is on display at the de Young Museum in San Francisco. Ecosystems of California (University of California Press, 2016) is a new comprehensive reference of California’s ecological abundance featuring contributions from 149 experts including 19 with ties to UC Santa Cruz. 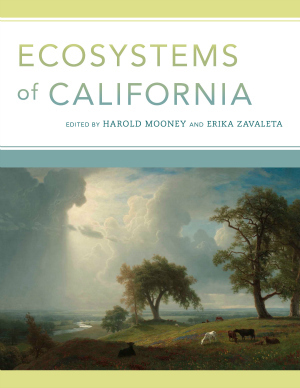 Co-edited by Erika Zavaleta, Pepper-Giberson Chair in Environmental Studies at UC Santa Cruz and Harold Mooney, Paul S. and Billie Achilles Professor in Environmental Biology, emeritus, Stanford University, the book examines California’s unique ecosystems through the lenses of past, present, and future. “It’s about where we’ve come from and how things got to be the way they are,” Zavaleta said. Zavaleta and Mooney, later her Ph.D. advisor, first talked about a book project in 2005. “We felt like there wasn’t a book that looked systematically at the history, dynamics, and the conservation of California ecosystems. The result is 41 chapters and more than 1,000 pages, covering the biologically diverse state from ocean to mountaintops, flora and fauna, aquatic and terrestrial, natural and managed. Each chapter evaluates natural processes for a specific ecosystem, describes drivers of change, and discusses how that ecosystem may be altered in the future. Zavaleta said the book is meant for three audiences: researchers; managers, policy makers and land stewards; and students. To both promote it but more importantly help make known its findings, the editors and some contributors are embarking on a series of private and public events. Zavaleta, Mooney, and others including Mark Carr, UC Santa Cruz professor of ecology and evolutionary biology, are planning to visit Sacramento Wed. Feb. 17 to brief state officials in the governor’s office and Office of Natural Resources. The next afternoon, the California Academy of Science in San Francisco will hold a symposium on the book with Zavaleta, Mooney, and other authors. The symposium is already sold out. Future events are being planned for Stanford and Southern California. “We live in exciting times,” Zavaleta writes in a blog about the new book. “California, as the rest of the world, faces accelerating change on every front. The happy news is that much of this ongoing change is also for good: leaving behind the long legacy of DDT and the nadir of our state’s air and water quality, discovering new restoration tools and conservation partnerships, innovating policy responses to climate change, recovering long-lost species, forging sustainable paths in forestry and fisheries management. “Hal Mooney and I envisioned Ecosystems of California to tackle a simple question: what do we know about the trajectory of this globally significant region’s ecology, from the deep past into the next 100 years,” she said. Other UC Santa Cruz affiliated contributors include Abraham Borker, Ph.D. ecology and evolutionary biology (EEB); Mark Carr, professor, EEB; Tara Cornelisse, Ph.D. alumna, environmental studies (ENVS); Don Croll, professor, EEB; Katherine Ennis, Ph.D student, ENVS); John Field, NOAA, based at the Long Marine Lab campus; Suzanne Langridge, Ph.D. alumna, ENVS; Elissa Olimpi, Ph.D student, ENVS; Flavia Oliveira, Ph.D. student, ENVS; Jae Pasari, Ph.D. alum, ENVS; Paulo Quadri, Ph.D. student, ENVS; Barry Sinervo. professor, EEB; Sarah Skikne, Ph.D. student, ENVS; Dena Spatz, Ph.D. student, EEB; Bronwen Stanford, Ph.D. student, ENVS; Bernie Tershy, adjunct faculty, EEB; Kerstin Wasson, adjunct faculty, EEB; and Amy Wolf, former postdoc, ENVS.